Previous studies have examined the association between ABO blood group and ovarian cancer risk, with inconclusive results. In eight studies participating in the Ovarian Cancer Association Consortium, we determined ABO blood groups and diplotypes by genotyping 3 SNPs in the ABO locus. Odds ratios and 95 % confidence intervals were calculated in each study using logistic regression; individual study results were combined using random effects meta-analysis. Compared to blood group O, the A blood group was associated with a modestly increased ovarian cancer risk: (OR: 1.09; 95 % CI: 1.01–1.18; p = 0.03). In diplotype analysis, the AO, but not the AA diplotype, was associated with increased risk (AO: OR: 1.11; 95 % CI: 1.01–1.22; p = 0.03; AA: OR: 1.03; 95 % CI: 0.87–1.21; p = 0.76). Neither AB nor the B blood groups were associated with risk. Results were similar across ovarian cancer histologic subtypes. 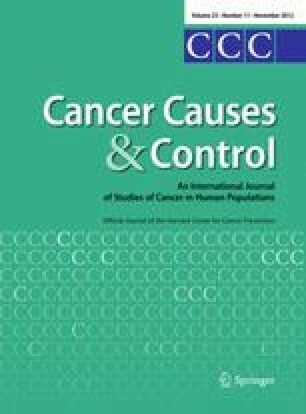 Consistent with most previous reports, the A blood type was associated modestly with increased ovarian cancer risk in this large analysis of multiple studies of ovarian cancer. Future studies investigating potential biologic mechanisms are warranted. The online version of this article (doi: 10.1007/s10552-012-0059-y) contains supplementary material, which is available to authorized users. We thank all members of the UKOPS research team, including research nurses, research scientists, data entry personnel, and consultant gynecological oncologists for their help in establishing the UKOPS case–control collection. In particular, we thank Aleksandra Gentry Maharaj, Usha Menon, Ian Jacobs, Eva Wozniak, Andy Ryan, and Jeremy Ford. The NHS and NHSII thank the following state cancer registries for their help: AL, AZ, AR, CA, CO, CT, DE, FL, GA, ID, IL, IN, IA, KY, LA, ME, MD, MA, MI, NE, NH, NJ, NY, NC, ND, OH, OK, OR, PA, RI, SC, TN, TX, VA, WA, and WY. The MAY study thanks Christopher Hilker and Jason Vollenweider for iSelect genotyping. OCAC: funded through the Ovarian Cancer Research Fund thanks to donations by the family and friends of Kathryn Sladek Smith; MAY: NIH R01 CA122443 and NIH P50 CA136393, funding from the Mayo Foundation; NCO: NIH R01 CA76016 and Department of Defense DAMD17-02-1-0666; NEC: NIH R01 CA54419, NIH P50 CA105009, and Department of Defense grant W81XWH-10-1-0280; NHS: NIH T32 CA009001, NIH P01 CA87969, NIH R01 CA49449, NIH R01 CA50383, and NIH R01 CA67262; POL: supported by the Intramural Research Program of the NIH, National Cancer Institute, Division of Cancer Epidemiology and Genetics, and the Center for Cancer Research; TBO: NIH R01 CA106414, ACS CRTG-00-196-01-CCE, Department of Defense grant DAMD17-98-1-8659, and the Celma Mastry Ovarian Cancer Foundation. ; TOR: grants from the Canadian Cancer Society, NIH R01 CA63682, NIH R01 CA63678, and NIH R01 CA080978; UKG: The UKOPS ovarian cancer case–control study is funded by a grant from the Oak Foundation. Additional research was funded by a charitable donation from UCLH special trustees, The Eve Appeal, Cancer Research UK project grant (no. C8804/A7058), a Medical Research Council Grant (MRC28209), and a European Commission Seventh Framework Program grant agreement #223175 (HEALTH-F2-2009-223175). Some of this work was undertaken at University College Hospital, London, which receives a proportion of its funding from the UK Department of Health’s National Institute for Health Research Biomedical Research Centre funding scheme..